BIRMINGHAM, Alabama - The Alabama Symphony's lingering search for a new music director has some distinct advantages. Those who can curb their impatience should pay close attention to the stellar array of guest conductors coming through Birmingham, whether or not they are in the running for the job. Andreas Delfs, the third such maestro in the young 2014-15 season, stepped on the podium Friday night and proceeded to mine the orchestra's strengths - a bold, aggressive sound tempered by sweet lyricism, rolled into a taut, mid-sized ensemble. But the concert's headliner was William Walton's Violin Concerto. Paul Huang, filling in for the originally scheduled soloist Elissa Lee Koljonen, displayed a brilliance that few 23-year-olds can. Commissioned by Jascha Heifetz and premiered in 1939, the concerto is one of most demanding of the 20th century, both for soloist and the orchestra. 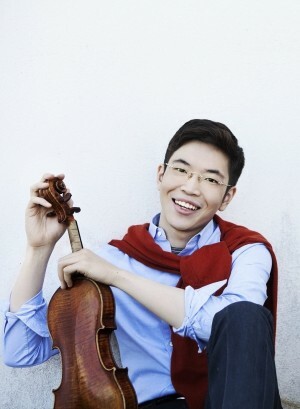 Huang captured its furiosity while delivering penetrating volume and sparkling technique that would be the envy of violinists twice his age. It helped that he was playing a 1742 Guarneri del Gesù once owned by Henryk Wieniawski (on loan from the Stradivari Society), an instrument that seemed to effortlessly fill Jemison Concert Hall. Of course, it takes someone with Huang's ability to project it to its full potential, and this combination of soloist and instrument would be hard to beat. Soaring high melodies and double-stops and lightning-quick scales played out with fullness and clarity, not merely for spectacle but for musical purpose. For the orchestra's part, it is no easy task to maneuver Walton's meter changes, motor-driven repetition and dramatic sense, but Delfs adeptly conveyed each nuance from soloist to orchestra. Huang offered an encore, portions of John Corigliano's Paganini-inspired "Red Violin Caprices," a further show of the violinist's lyrical sense and technical wizardry.